Today for the first time ever I showed up for a photo and was welcomed by a choral serenade and fresh baked bread. Man, they know how to welcome guests here! I was visiting Ivankiv, the last remaining inhabited town before the Chernobyl exclusion zone. 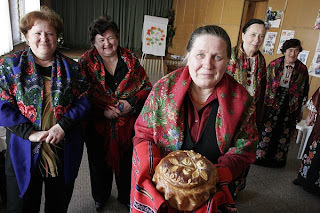 These women are members of a 45-women choir dedicated to preserving traditional songs and dances of the Polissa region, and supporting each other in tough times. 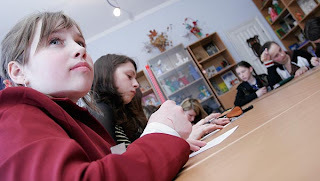 Students from the village of Dmitrovka, 52 miles south of Chernobyl, participate in a Youth Action Project workshop focused on how to be an activist and how to improve health conditions in radiation-affected areas. I can't even count how many classrooms I've shot in over the years. I've been interested to note that Ukrainian teenagers don't look much different from American teens. Except better dressed. In shooting classes, the challenge is often this: everyone sits around a table, quietly listening, or perhaps daydreaming, or perhaps bored out of their minds. It takes patience to catch the moment when everyone in the shot is engaged. Plus you need a composition that is interesting to look at and you want to show both a primary subject and some context. Often the best moments are at the very beginning and end of a class; the shot above was during a moment of reflection as the session ended. After I shot the photo above, it reminded me of another photo I made in 2003 at the Linden Drive preschool at UW-Madison. As some of you know, I am currently working on a documentary photo project on people affected by radiation in the former Soviet Union. 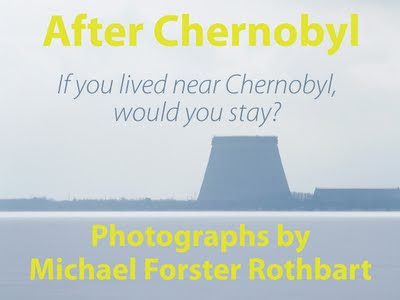 Other photographers have already made some powerful documentaries on the direct results of radioactive pollution and nuclear accidents like Chernobyl. I am taking a broader view and also looking at the secondary impacts on these communities. Such as alcoholism. So far, I've not posted these photos here as I am still seeing how all the stories fit together. I just thought I'd share a sample photo from yesterday. Sasha Starovoitenko (in suit jacket) leads an Alcoholics Anonymous meeting in the Chernobyl Community Center in Borodyanka, Ukraine. Sasha was a liquidator in Chernobyl, serving in the army during the clean-up effort following the 1986 catastrophe. Afterwards, he began to drink and spent many years as an alcoholic. Today he serves as an alcohol prevention counselor for the community center. Borodyanka is a small town (population 16,000) 48 miles south of the Chernobyl nuclear power plant, where many Chernobyl evacuees were resettled in 1986. I love these steep old cobblestone streets. I love the regular but uneven pattern of the stones, the handmade look they have. I love the way the light reflects off the old cobbles. So I've been playing in the street. 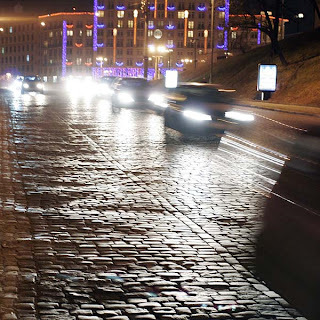 Above, cars speed down Vladimirskiy Spusk (Vladimir's Descent). 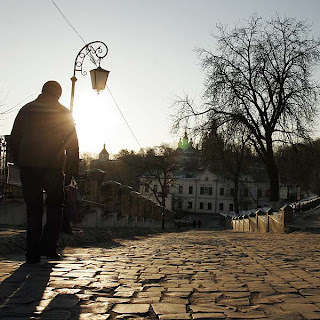 Below, a man walks towards Khrestovozdyvzhenska church in Pechersk. 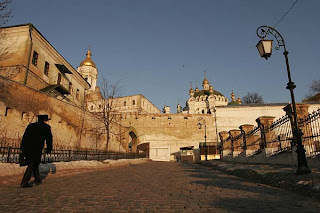 I returned to the Pechersk Lavra at dawn. The golden sunlight turned the smog into a thing of beauty. The cupolas were lovely but the composition didn't excite me, so I shifted the tripod over a foot and put an out-of-focus fencepost into the middle of the frame. 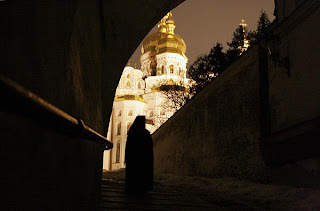 Below, I rephotographed the same view up the hill to the Upper Lavra as I did a few weeks ago after sunset. I've been talking about editing with photographer Petro Morgos. Petro was out with me last Sunday when I shot this group of four students. He proved a great distraction, so that the students paid less attention to me as I shot. I am not a fast editor of my own work. I often end up with three or four frames I like, put them in a slideshow and watch the subtle differences flicker past. So here is an alternate edit of the four students. I actually prefer this shot to the one I first posted. It fits my mood better: even though they are sitting together, three of them look distant, all slightly aloof, lost in their own thoughts. The other shot, taken seven seconds earlier, feels more collegial. Shooting for myself instead of a client, I have the freedom to be moody. 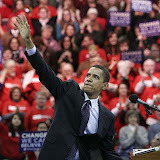 No more damn shiny happy people holding hands! Students from the International Solomonyv University in Kyiv hang out on a bench in Pobedy Park on a warm Sunday afternoon in March. It was the kind of moment photographers dream about. 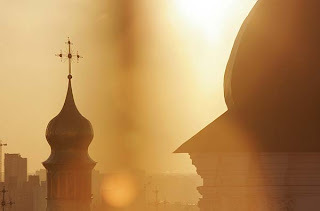 Jacob and I were on a trip to scout out the 950-year-old Pechersk Lavra monastery at sunset. I've had this picture in my head, of one of the onion-domed churches silhouetted against a sunset sky. Why scout? I wanted to figure out what my options were, so I was hauling 20 pounds of sleeping baby over the snowy hills, instead of 20 pounds of more camera gear. Tripod, remote, other junk I too often carry around and too seldom use. The light had faded to a dull winter-gray sky, and I didn't expect to make photos other than future idea shots. We were crouching in a dark empty alley, looking up at the Church of the Assumption, built in 1077 A.D. Suddenly a swarm of monks came rushing down the hill in their black cloaks. Every element was there for a perfect photo (except that tripod), and I knew it was up to me to make it. And that's when Jacob woke up and started whimpering. The monks stared at us as they sped past. So did I get the shot? No, not quite. I made some nice photos and it's hard to believe I got anything at all (shooting handheld at 3200ASA, F4, 1/8 to 1/13 of a second). But I know I'll have to go back to that alley — with the tripod, without the baby — and wait for the monks to show up. Here are some other test shots from the monastery, all places I'll revisit in different light.